ACOS6 is a high speed and flexible smart card offering cost effective solutions. It is specifically designed to address the requirements of multiple applications and multiple e-purses with secure hierarchy for multiple levels. Providing each independent application with a secure environment, it is suitable for a wide range of applications in government services, payment applications, online top-up, loyalty programs, and more. 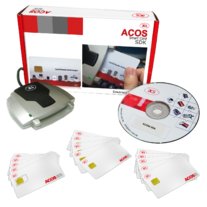 The ACOS6 Multi-Application & Purse Smart Card Software Development Kit (ACOS6 SDK) is designed for professional developers who are interested in developing applications on ACOS6 and ACOS6-SAM. It contains tools allowing one to learn the ISO7816-4’s file structure on ACOS6, as well as a personalization scripting tool, the Scripting Tool Plus, enabling one to personalize a smart card. Further, development of applications is facilitated through the unique ACS Card Tool, which allows users to send direct commands to any PC/SC-compliant smart card readers and cards. With these useful tools and a user-friendly interface, the development kit can reduce the time and cost that users invest into R&D and Marketing.